We will only process your personal data in accordance with applicable data protection and privacy laws. We need certain personal data in order to provide you with access to the Site. If you registered with us, you will have been asked to agree to provide this information in order to access our services, purchase our products, or view our content. This consent provides us with the legal basis required under applicable law to process your data. You maintain the right to withdraw such consent at any time. If you do not agree to our use of your personal data in line with this Policy, please do not use our Site. We seek to use reasonable organizational, technical and administrative measures to protect personal data within our organization.We do not sell, trade, or rent Users personal identification information to others. Unfortunately, no transmission or storage system can be guaranteed to be completely secure, and transmission of information via the internet is not completely secure. If you have reason to believe that your interaction with us is no longer secure (for example, if you feel that the security of any account you might have with us has been compromised), please immediately notify us of the problem by contacting us. We are committed to resolving any complaints about our collection or use of your personal data. If you would like to make a complaint regarding this Policy or our practices in relation to your personal data, please contact us through the information listed on our website. We will reply to your complaint as soon as we can and in any event, within 30 days. We hope to resolve any complaint brought to our attention, however if you feel that your complaint has not been adequately resolved, you reserve the right to contact your local data protection supervisory authority. We welcome your comments or questions about this Policy. 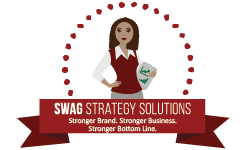 You may contact us at www.swagstrategy.com or at info@swagstrategy.com.